Hey Harriet sponsors the Shadow Shot Sunday meme. Great shot, it sure draws you in. Now that is really different. Beautiful and yet a little scary looking. Wonderful shot. Fabulous shadow shot! It does indeed draw you in! love the hues in this photo...very nice. very nice.....love the perspective and the colors. Shadows and light seem to melt together! Very beautiful! Stunning! Have a great weekend. Oh, so familiar. We really did take a ton of photos, didn't we? I love the hints of blues, it gives it a cool, mysterious, almost sinister look, very nice shot! Love your new header Mary! I really like the shadow and light in this. The brick and railing appear cold but the light brings in a feeling of warmth. Warm and cold blended beautifully! Love this Mary! The shadow play here accents the architecture! this is the coolest shot!! i really like it!! well doe. Beautiful! I love the colous around the edge of the light from the windows. I need to get there. You pique my curiosity. What a beautiful place. Gorgeous photograph. 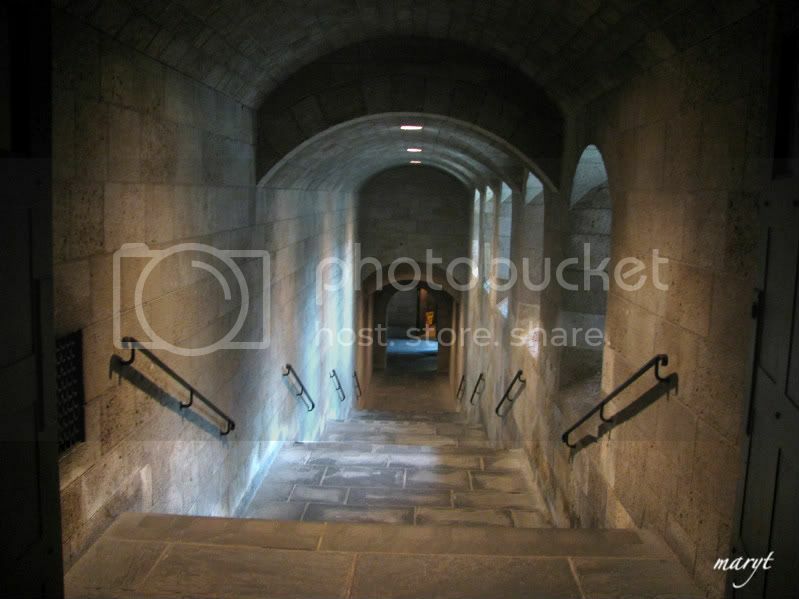 Ah, yes, the cloister walk. Very relaxing.